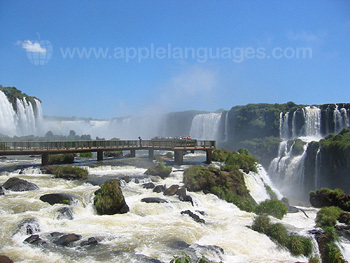 Learn Spanish in Argentina in a group class, on a one-to-one basis with a private tutor, or alongside tango or salsa lessons. 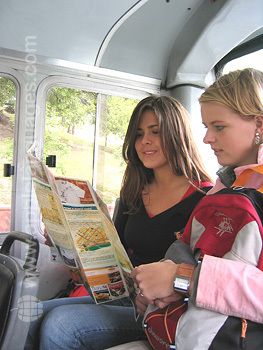 You can study individually or in a class with a maximum of just 9 students, and at the same time enjoy the wealth of culture, history and activity that Buenos Aires has to offer. The friendly and welcoming locals enjoy a relatively high standard of living and are keen to speak Spanish with students. At our school you will study Spanish in a class with students from all over the world. You can also combine your Spanish course in Buenos Aires with a course at our other schools in Argentina, or with volunteer work or internships. Book any Spanish course for 4 weeks or longer at our Capital Federal school and get a 20% discount! Offer applies to the course only and does not include accommodation. Students at our Buenos Aires (Retiro) school have their Spanish classes just a short walk from the seafront or the city’s General San Martin Plaza park. It’s surrounded by sights, shops, and restaurants, meaning you are never far from something entertain to do, see, or try after your classes have finished! You can combine your Spanish study with a class in Business Spanish, a Spanish & Tango or a Spanish Literature/Art/History class or with volunteer work or internships arranged by the school. As well as offering high-quality tuition, the school also boasts spacious classrooms, an audio & video room, a cafeteria, a students’ meeting room, a computer room, and an outside area for use on sunny days. Our Retiro school offers group programmes of 25 or 37 lessons per week, private tuition of any amount per week (though the school’s standard package is 10 weekly classes), or a combination of group and private lessons. Dance lovers will enjoy the schools Spanish & Salsa/Tango course, which adds 8 weekly dance classes to your language lessons. Furthermore, you can combine your period of study in Buenos Aires with study elsewhere in Argentina - at our schools in Cordoba, Mendoza, Bariloche or in Ushuaia, Patagonia, the extreme south of Argentina. If you want to learn as much Spanish as possible during your time in Argentina, you should choose to stay with a host family. Not only will you then learn Spanish at our school but also practise what you study with your Argentinean host family. Private apartments and the student residences are also available. Our Retiro school organises extra-curricular activities both in the school and in the Buenos Aires area, including class trips to soccer games, an Argentina cookery class and Spanish film evenings. Weekend excursions further afield are also offered. Our school offers a transfer service on arrival and/or departure at Buenos Aires Ezeiza or City airports for an additional fee. Please contact us for more information about this service. Average score for our school in Buenos Aires (Retiro) based on 40 previous client reviews. My spanish course was very good and i was happy with this school .the teaching level was good and i got plenty of assistance, The director is very efficinet and attends to any student issues very promptly . They were very accomodating also as i took breaks to travel and returned to the school after a couple of weeks. 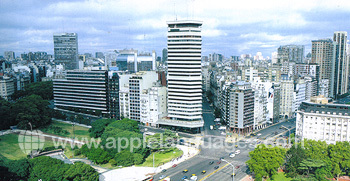 This is great place to learn spanish and buenos aires is fantastic city. Nice course, and nice teacher the first 3 of 4 weeks. Very nice family. Nice as well to live with a few other travelers (the family hosted up to 6 persons). The people in the family was very nice. I took the beginners course, the teacher, was marvellous, energetic and understanding. As the course was taken in Spanish, I did not understand most of the instructions but it was obvious this was the only way to learn. I did find it difficult but hope to contijnue learning now I am home. Nice and enthousiastic teachers. The house was OK, met some real fun people, nice housekeepers, bathroom clean, breakfast nice, etc, but the room was far too hot. My spanish course in Buenos Aires was well organized. The teacher, Lucia, was excellent. She was always on time, very dedicated to teaching the class. My Tango dance teacher, Gustavo, was great at teaching the dance. The hostal I stayed at was not too bad, cleanliness of the accomodation and safely was no problem. The school is absolutely amazing! I was only there for a week - so much too short! I chose super-intensive (6 hours/day) but the lessons didn't drag on at all - it didn't feel too intense. The lessons themselves were enjoyable, the people were lovely, and the whole school had a friendly atmosphere and environment - everyone of all ages, nationalities etc mixed and made friends. In the afternoon, my lessons often took place outside of the school - museums, notable sites; even a famous cafe! I learned so much more than just Spanish - we had animated discussions about history, politics and religion in Argentina as well as the countries of all the class members. An amazing place to learn. Brilliant location, perfect setup - very simple, but nicely done. An open, airy space suitable for relaxing, socialising and working. 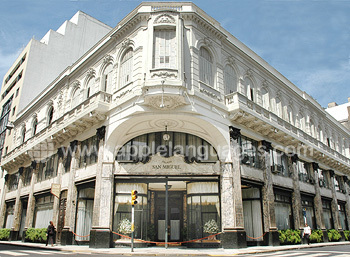 A calm and friendly environment, and in a stunning location (right above the Plaza del Congreso). You really feel in the heart of the city, and, although not right next to the school, I really enjoyed the 15 minute walk there and back. A lovely feel. The best thing I have ever done, such an amazing experience! Everything you do and learn in the school; all the locals you meet; the other students you meet all of different nationalities; the adventure, especially if you go on your own (which I did - it's really not a problem, a lot of people do and everyone mixes and makes friends!) and really, just a welcome change from your normal routine. 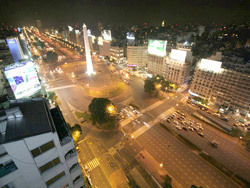 I'm in love with Buenos Aires, and raving about my stay to anyone who will even pretend to listen!!! The morning class for beginners was great and I learned a lot. I enjoyed my stay in the accommodation, because spending time with other students from the same school helped a lot to improve my Spanish. I had an excellent teacher, and the school was really well organised. The course was fantastic - everything about the school made it a great place to study, meet people and use as a base and information centre to find out what to do and see in the city. I learnt so much and enjoyed every minute of it because the teachers were constantly thinking of new things for you to do (in and out of class) to experience the culture and learn the language at the same time. I had a wonderful host mother who was always around to help or just chat to us and was an amazing cook! Living in a host family home with other students like this was great for me because it was easy to get into the city and for us to all do things together or just have dinner and stay in. The course was great - my Spanish teachers were professional, interesting and knew their subject well. The tango teacher was also very good, and the experience was quite satisfying. Teachers are great, I've learnt a lot. I stayed with an Argentinian host family. The food was excellent. My family took me to many concerts, cultural activities and interesting places. Lessons were interesting and quite relaxed, other staff were really friendly as well and were always so helpful it made everything very easy. The student residence was excellent, in a very central location close to the school and had everything else you could need. Facilities were good overall. Amazing experience, really enjoyable. The classes were well structured with good teaching. 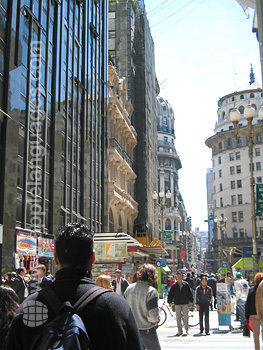 I was pleased with the five weeks I spent in Buenos Aires. I had 4 different teachers in 5 weeks which was good as it meant that I became used to different accents and pronuciation. I was also very pleased with my private classes in the afternoon. I was happy with my accomodation - it was clean & the family were friendly. I really enjoyed the course. My accommodation was wonderful. The family I stayed with were very helpful and made me feel really welcome. I thought the course was great! I wish I could have stayed longer. I liked the course a lot and my teacher was very good and patient. Loved the family that I stayed with, they were all friendly, kind and eager to help or just chat. I had a great time with them! Buenos Aires is an incredible city and I had an amazing time! Tango and more in Buenos Aires! I can’t believe I’m in Argentina! Spanish and Football in Buenos Aires! 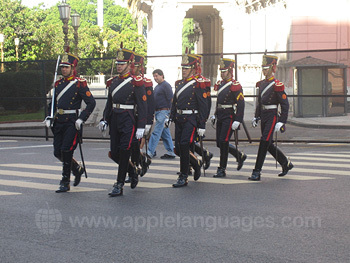 Buenos Aires, Argentina where I’ve chosen to learn Spanish.